Forum: Financial Investment Forum. - This forum is for financial topics only. Please adhere to forum rules. Violators will be banned from this forum and possibly the entire site. First time on the c call they actually mentioned their developing relationship with Amazon, and Walmart . Net sales were $69.5 million compared to $73.8 million. Gross margin was 27.4% compared to 29.6%. Net income was $0.4 million, or $0.01 per share, compared to $0.9 million or $0.02 per diluted share. Adjusted EBITDA (a non-GAAP measure defined below) was $2.5 million compared to $3.6 million. Ended the quarter with no revolver debt. Conversion rate increased 70 basis points to 2.7%. Average order value increased 4% to $85. Revenue capture increased 190 basis points to 87.5%. CARSON, Calif., Nov. 28, 2018 /PRNewswire/ -- U.S. Auto Parts Network, Inc. (NASDAQ: PRTS), one of the largest online providers of aftermarket automotive parts and accessories, has appointed Lev Peker as director and chief executive officer, succeeding Aaron Coleman effective January 2, 2019. Peker brings considerable marketing and operational expertise to U.S. Auto Parts (PRTS), having previously served as chief marketing officer of Adorama, a leading online destination for photography, imaging, audio and consumer electronics, as well as senior director and general manager of e-commerce strategy and operations at Sears. This will be Peker's second stint with U.S. Auto Parts, having previously held various managerial positions on the finance and online marketplace teams from 2008 to 2014. U.S. Auto Parts Chairman Barry Phelps commented: "Lev has a strong track record of driving growth through both traditional and digital marketing channels. During his time at Adorama, he was instrumental in improving the company's visibility across retail, online, mobile and social media channels, while also serving as the architect behind the company's content strategy and marketing campaigns to boost traffic and conversion. Given his previous tenure with U.S. Auto Parts, his familiarity of our business and competitive dynamics will enable him to hit the ground running." "I would like to thank Aaron Coleman for his many years of service to U.S. Auto Parts. He has been an exceptional executive for our company for more than 10 years, and we wish him all the best in his future endeavors." Peker commented on his appointment: "U.S. Auto Parts has been serving customers for more than 20 years and has established itself as one of the premier online providers of aftermarket auto parts. We have a strong foundation to build on with millions of orders every year across a diversified range of sales channels, including several owned and operated e-commerce sites and multiple online marketplaces like eBay, Amazon and Wal-Mart (WMMVY). I look forward to leveraging my e-commerce and marketing experience to return U.S. Auto Parts to growth and maximize shareholder value." Established in 1995, U.S. Auto Parts is a leading online provider of automotive aftermarket parts, including collision, engine, and performance parts and accessories. Through the Company's network of websites, U.S. Auto Parts provides consumers with a broad selection of competitively priced products, all mapped by a proprietary database with applications based on vehicle makes, models and years. U.S. Auto Parts' flagship websites include www.autopartswarehouse.com, www.carparts.com, and www.jcwhitney.com, as well as the Company's corporate website at www.usautoparts.net. U.S. Auto Parts is headquartered in Carson, California. The track record of the company is actually pretty dismal, especially given general e-commerce tailwinds. But the valuation of the shares already reflect this record. There is a new CEO and to deals with industry behemoths that offer an interesting opportunity here. The biggest problem is the declining traffic to their websites, it's difficult to see a clear way forward here, we have to admit. 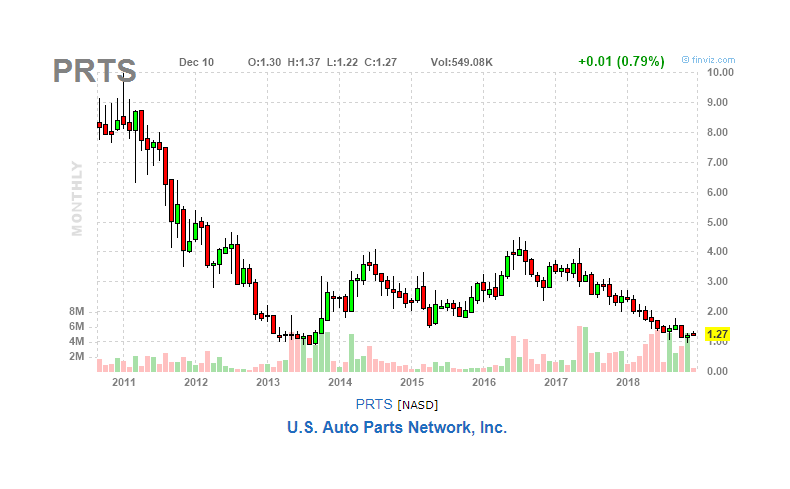 We think Auto Parts Network (PRTS) is a speculative buy here on low valuation, two interesting deals that can possibly act as catalyst. But against that there are pretty intractable problems as well, most notably declining traffic to their websites. Auto Parts Network appointed a new CEO, Lev Peker at the end of last month. Peker was involved in the company in various roles from 2008 to 2014 when the rot had already set in. Here are the last five years, which shows little progress, basically. Net sales were $69.5M compared to $73.8M. Total orders declined from 915K to 815K in Q3. Gross margin was 27.4% compared to 29.6% a year ago. Net income was $0.4M, or $0.01 per share, compared to $0.9M or $0.02 per diluted share. Adjusted EBITDA was $2.5M compared to $3.6M. E-commerce conversion increased 70 basis points to 2.7%, despite e-commerce orders being down 4% to 443K. Customer acquisition cost increased to $7.31 from $6.95 in Q3 last year. Issues with a channel partner. we also experienced lower marketplace sales with one of our channel partners due to a reduction in search presence on their platform. We've gone through similar cycles in the past, where a marketplace partner makes an update to their platform that adversely affects our business over the short-term and we expect this situation to be no different. In the past, we've responded positively to these changes to improve our presence with them over time. This is accomplished fundamentally with strong titles, images, applications, listing data and tremendous service levels. At the time, the court order was granted; Customs was holding approximately 200 of our shipping containers that carried not only the grilles alleged to be counterfeit but many of our other products as well. So although the seized automotive grilles initially accounted for less than 1% of our annual revenue, we began to experience out of stock rates across many other categories due to the backlog of containers which Customs were holding. We also began to incur significant port and carrier fees resulting from the increased period of time for containers remained at the port. With respect to the non-grille imports, the issue seems to have been resolved by the end of July but the company has stopped sourcing grilles from outside the US despite their firm belief that what they were importing didn't constitute any trademark infringement. Despite the favorable court order, the Company continued to experience issues with product flow arising from CBP's inability to process the Company's shipping containers in an expeditious fashion. As a result, the Company incurred significant port and carrier fees resulting from the increased period of time the Company's containers remained at the port. The fees associated with this unreleased product, as well as the increased legal costs associated with the product seizures and the bonding litigation, aggregated to $1,784 through the third quarter of 2018. As of the end of the third quarter, all product not implicated by the trademark infringement allegations has been released by CBP. The third group was implemented on September 24 and was reported as $200 billion in scope. The third group covers the majority of our industry and impacts 14% of our net sales. As previously discussed, our goal in any tariffs will be to pass the cost along to consumers and maintain our gross profit. From a traffic perspective, we continue to see a decline in the third quarter, driven by lower organic traffic and a decline in paid traffic due to unfavorable customer acquisition economics. Walmart.com has become a marketplace partner. The company implemented a "direct 1PL" model with Amazon. These are of course the two behemoths of American retail, so any developments here can quickly move the needle for a company with roughly $300M in sales. The marketplace agreement with Walmart.com enables the company to sell on Walmart.com and it is in the process of scaling this up. But only began doing limited tests at the end of last quarter and the beginning of this quarter. So that assortment has been relatively limited, it's a little bit different model. So we wanted to make sure that we're set up success to scale those in the future. So that's very early on. The word we have to go by is 'direct,' which suggests that they open a direct sales channel on Amazon, rather than competing with other parts providers on the Amazon marketplace. 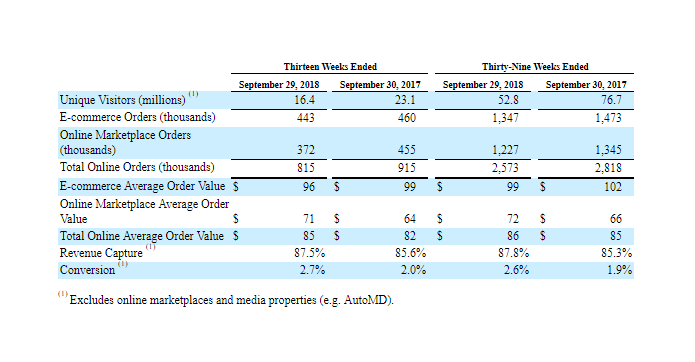 That could both boost sales, increase margins, and perhaps reduce some of the fears that Amazon would completely take over online autoparts selling, so we take it as a positive. But unless more specifics are forthcoming, it's difficult to assess what the potential is here. Offline and wholesale, which is actually growing but still less than 10% of revenue. E-commerce; sales from websites such as www.autopartswarehouse.com , www.carparts.com, and www.jcwhitney.com and their corporate website is located at www.usautoparts.net. Online marketplaces like Amazon (AMZN) and Ebay (EBAY). For example, during the YTD Q3 2018 the online marketplaces sales grew to 36.2% of total sales, compared to 34.7% in the YTD Q3 2017 . Any mix shift in sales to marketplace channels could result in lower gross margins, and as a result, our business and financial results may suffer. There is another effect as the sales on the marketplaces disproportionally involve branded products (rather than their white label stuff) which carry lower margins. The U.S. Auto Care Association estimates that overall revenue from online sales of auto parts and accessories is projected to increase to approximately $13.2 billion in 2018 and more than double by 2023. Improved product availability, lower prices and consumers' growing comfort with digital platforms are driving the shift to online sales. We believe that we are well positioned for the shift to online sales due to our history of being a leading source for aftermarket automotive parts through online marketplaces and our network of websites. Perhaps the inclusion of Walmart as a new channel can revive this, but we have to say the history isn't terribly encouraging. The growth in online sales isn't something new, and so far the company hasn't been able to benefit in a comprehensive way. The website traffic numbers are declining. Traffic acquisition cost (mostly paid search) are increasing. The conversion of visitors into sales is ticking up of late, that doesn't seem to be the problem. It's amazing to think that PRTS's unique viewers were down by more than 50% from the same quarter in 2011. While some of this decline was intended by the company as it has sought to rationalize the number of websites in its network, we believe the largely forgettable names of the company's remaining flagship websites - www.autopartswarehouse.com, www.carparts.com, and www.jcwhitney.com - are at least partially responsible for the continued evaporation of consumer interest. We currently have over 55,000 private label SKUs and over 1.5 million branded SKUs in our product selection. A potential conflict of interest of a board member arguing for a share buyback when a large fund, OIP, was distributing shares. Possibly misleading investors. The company has indeed eliminated its revolver debt, but it has simply substituted it for letters of credit which were not included in all filings. The guaranteed total letters of credit balance at September 29, 2018 was $15,246 , of which $11,102 was utilized and included in accounts payable in our consolidated balance sheet. 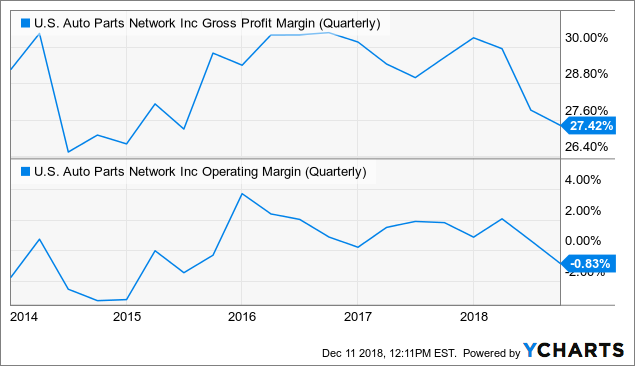 PRTS Gross Profit Margin (Quarterly) data by YChartsThe decrease in gross margins (from 29.6% last year to 27.4% in Q3) was primarily driven by cost associated with port and carrier fees from the customs issue as well as increased freight costs. Excluding these fees, gross margin would have been 28.7%. As a result of the amortization treatment of port and carrier fees from the Custom issue, we continue to expect gross margins to remain between 27% to 28% over the next two quarters. 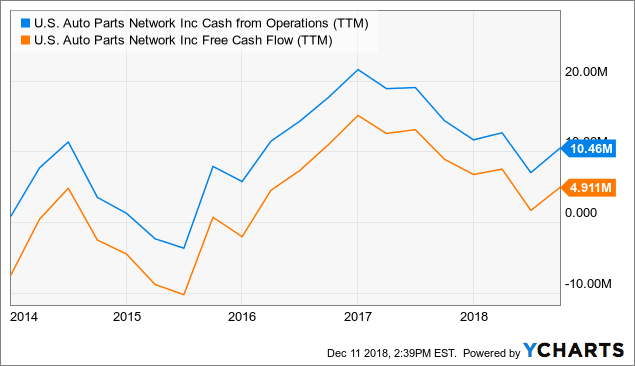 $5.5 million of the cash balance is attributable to the timing of payments with one of our shipping vendors, which we expect will normalize during the fourth quarter. The company ended the quarter with $8.3M of cash on its books, up from $2.9M nine months ago and no debt. 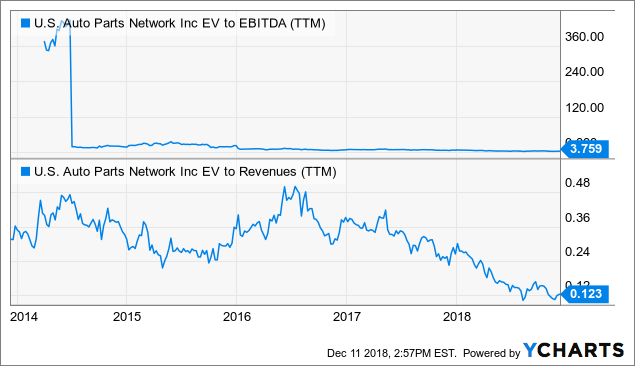 PRTS EV to EBITDA (TTM) data by YChartsValuation metrics have declined, which is no surprise given the company's lack of revenue growth. The company has a history of disappointing growth against what seems to be a favorable background (the secular growth in online sales). Web traffic is declining. Growth of their high margin private label is declining. Traffic acquisition cost are increasing. It's not a pretty picture. Against that stand a pretty cheap valuation, two new and potentially very significant deals with market behemoths, increased conversion rates and the potential to do better in the hands of a new CEO. We would classify this as a speculative buy, with the two new deals and the low valuation as the main factors. CARSON, Calif., Jan. 23, 2019 /PRNewswire/ -- U.S. Auto Parts Network, Inc. (PRTS), one of the largest online providers of aftermarket automotive parts and accessories, has appointed David Kanen to its board of directors, effective immediately. His appointment expands the board to nine members and fills an open vacancy. Kanen currently serves as the managing member of Kanen Wealth Management, LLC, a registered investment advisor, and is the largest stockholder of U.S. Auto Parts. Prior to founding Kanen Wealth Management, he held several investment advisory positions over the course of his career, including serving as an independent advisor for Aegis Capital and financial advisor for A.G. Edwards & Sons. Kanen also serves on the board of directors for Famous Dave's of America, Inc., which develops, owns, operates and franchises barbeque restaurants. "We are delighted to welcome David to our board. David brings nearly three decades of advisory and leadership experience," said Barry Phelps, Chairman of the Board for U.S. Auto Parts. "His strategic insight will be an invaluable asset as the company looks to capitalize on the growing online demand for aftermarket auto parts. And with the addition of our largest stockholder to the board, we believe our stockholders' interests will be very well-aligned with the strategic direction from our board." Kanen commented: "U.S. Auto Parts is uniquely positioned to serve today's consumer with a robust e-commerce platform and marketplace business that provides affordable aftermarket auto parts to consumers across the country. I look forward to collaborating with the rest of the board and management team as we develop and refine leading strategies to return U.S. Auto Parts to growth and deliver stockholder value." About U.S. Auto Parts Network, Inc.
CARSON, Calif., March 7, 2019 /PRNewswire/ -- U.S. Auto Parts Network, Inc. (PRTS), one of the largest online providers of aftermarket automotive parts and accessories, is reporting results for the fourth quarter and full year ended December 29, 2018. All information and data are from continuing operations, which exclude the AutoMD operating segment unless specifically noted. Net sales were $64.6 million compared to $68.5 million. Gross margin was 25.6% compared to 30.3%. Net loss was $4.5 million, or $(0.13) per share, compared to $4.1 million or $(0.12) per diluted share. Adjusted EBITDA (a non-GAAP measure defined below) was $0.7 million compared to $2.8 million. Net sales were $289.5 million compared to $303.4 million. Gross margin was 27.2% compared to 29.6%. Net loss was $4.9 million, or $(0.14) per share, compared to net income of $24.6 million or $0.62 per diluted share. Adjusted EBITDA was $10.4 million compared to $14.2 million. "U.S. Auto Parts has a rich history of providing consumers with affordable aftermarket auto parts, be it through the company's robust e-commerce platform or its third-party online marketplace partners," said Lev Peker, CEO of U.S. Auto Parts. "We are also uniquely positioned in an online industry sector that is expected to more than double by 2023 as consumers continue to shift their auto parts shopping online. We have strong assets in place, a highly-efficient supply chain and over 1.5 million SKUs of high-quality private label and branded products to serve this growing consumer base." "U.S. Auto Parts struggled in 2018, and the company's results have been disappointing to everyone. However, having assumed the leadership role just a few months ago, I have already identified multiple opportunities designed to return U.S. Auto Parts to profitable revenue growth, particularly within our e-commerce channel. This will require a reallocation of resources and incremental investments in personnel, technology and marketing strategies in 2019, along with a better utilization of the millions of consumer data points we generate every month." "We are in the early stages of developing and deploying these new initiatives, and we will likely have to take a step back before moving forward. However, we expect to begin realizing some of the benefit from these initiatives towards the end of 2019. 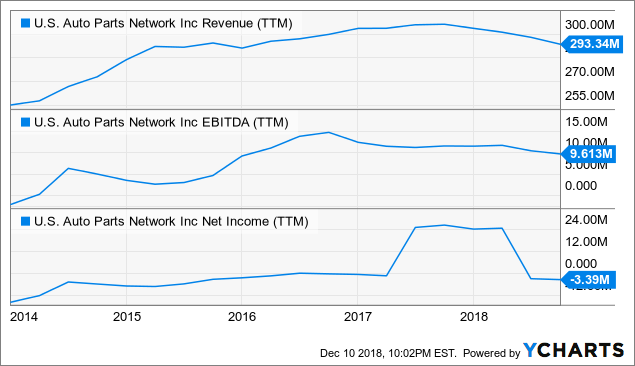 Although we have plenty of work ahead, we have every expectation of growing revenue in 2019 and delivering positive adjusted EBITDA. The opportunities ahead for U.S. Auto Parts are just beginning, and I look forward to leading the team and all stakeholders into this next chapter of growth."